Two live individuals of Zonitoides arboreus on the roots of orchid plants. 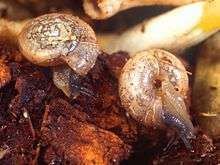 Gastrodontoidea is a taxonomic superfamily of air-breathing land snails, terrestrial pulmonate gastropod mollusks in the limacoid clade. 1 2 3 Pfeffer G. J. (1930). "Zur Kentniss tertiärer Landschnecken." Geologische und Paleontologische Abhandlungen new series, 17(3): 1-230., plates 1-3. page 17, page 10 and page .